Blue marguerite is a long-lived member of the daisy family, which can flower throughout the year. It belongs to the genus Felicia, which is thought to be named after a German official, Herr Felix, who died in 1846. 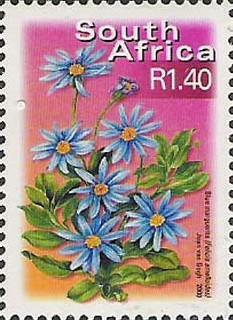 Blue marguerite is a South African perennial, popularly cultivated for its bright blue flower heads. 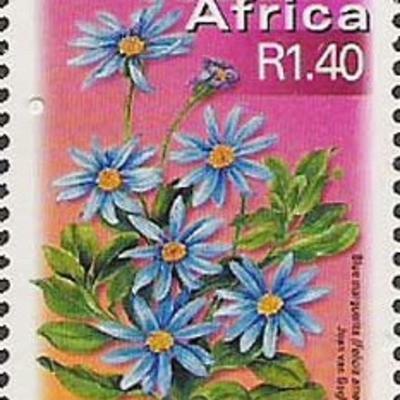 Blue marguerite is native to South Africa, where it can be found growing on coastal sand dunes, sandy flats, exposed stony hillsides, gravelly slopes, basalt cliffs and among outcropping rocks below 1,000 metres above sea level. Overview: A densely branched herbaceous perennial, which grows up to 1 m high. The stems are green to dark red and the leaves are rough, hairy and borne opposite each other on the stem. The leaves are dark green above and light green below. Because of a covering of short stiff hairs, stems and leaves can feel like fine sandpaper to the touch. Flowers: The compound flower head (capitulum) is bright yellow in the centre (the bisexual disc florets) with a ring of sky-blue female ray florets around the outside. The particularly striking flower heads are about 3 cm in diameter and are held well above the leaves on leafless stalks, which are up to 18 cm long. 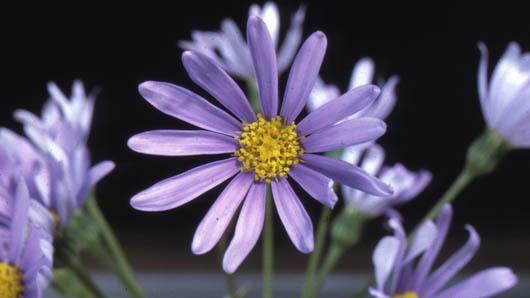 Unlike many other members of the daisy family, the flowerheads of F. amelloides do not close at night. Fruits: The cypselas (fruits) are dark brown with tiny hairs. Each fruit is shed with its pappus which, acting like a tiny parachute, helps to disperse them. There are no major threats to this species in the wild at present. This could change in the future, as a result of the disturbance of coastal habitat by the construction industry, in particular for the building of holiday homes. It is mainly used as an ornamental, but has also been used to stabilise sand dunes, due to its ability to withstand dry, windy areas. This South African Felicia makes an excellent garden plant. It is commonly found in cultivation in South Africa and is also grown in Europe. A variant with variegated leaves is available. 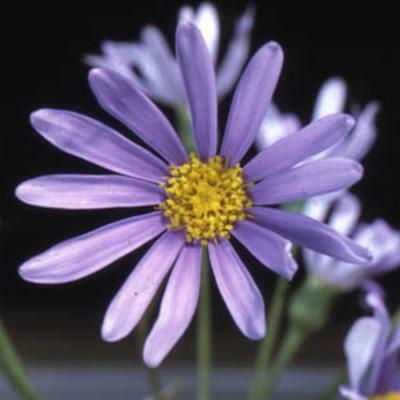 Blue marguerite can be propagated easily from cuttings or seeds. A free-draining substrate is required and plants should be given regular, moderate watering. Felicia amelloides has been grown from seed at Kew for display in the Temperate House, where temperatures are kept above a minimum of 3˚C in order to overwinter the plants successfully. A position in full sun is ideal. Whitefly and aphids have proved problematic from time to time and these are kept under control by the use of biological and cultural controls. In order to keep blue marguerites looking their best they should be re-propagated each year; however, it is easier to trim back the plants from time to time. Dead-heading can also be carried out to prolong the flowering period. Blue marguerite can be seen growing in the Southern Hemisphere Garden (South African bed) at Wakehurst Place. Between April and October 2010, Kew and the British Museum brought a small corner of South Africa to the heart of London. The South Africa Landscape celebrated a shared vision to strengthen cultural understanding and support biodiversity conservation across the world. Felicia amelloides (blue marguerite) was one of the star plants featured in the Landscape. Coastal sand dunes, sandy flats, exposed stony hillsides, gravelly slopes, basalt cliffs and among rock outcrops. Felicia amelloides O.Hoffm. ex Zahlbr. Cullen, J., Alexander, J.C.M, Brickell, C.D. (eds) (2000). The European Garden Flora Vol. VI Dicotyledons (Part IV): 583. Cambridge University Press, Cambridge. Huxley, A., Griffiths, M. & Levy, M. (eds) (1992). The New Royal Horticultural Society Dictionary of Gardening. Vol. 2 (D to K): 283. Macmillan Press, London. Hilliard, O.M. (1977). 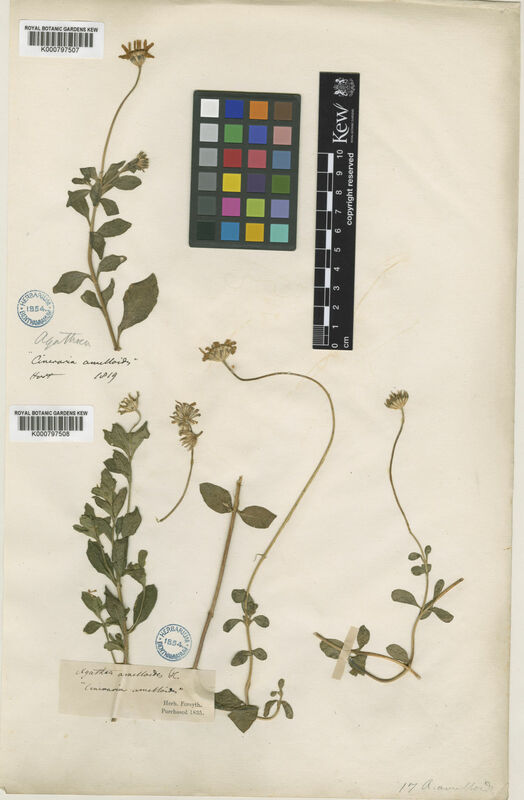 Compositae in Natal. University of Natal Press. Grau, J. (1973). Revision der Gattung Felicia (Asteraceae). Mitteilungen der Botanischen Staatssammlung Munchen 9: 195-705.